If you find walking outdoors difficult or need to rest frequently, perhaps it's time for you to consider using a walking frame. They can open up so many new possibilities by providing a means of support to assist your walking. 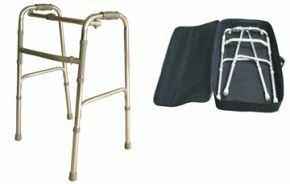 This versatile foldable walking frame is an ideal purchase if you do have mobility issues. It's sturdy, compact and easy to transport and store when not in use, due to its smart folding feature. It even comes with its own luxury padded carrying bag! This dual function folding walking frame can be used as either a reciprocal or fixed style walker, and is made from lightweight anodized aluminium. An ideal height adjustable walker that will promote safe user confidence.